Crunchy, delicious pumpkin seeds are high in calories; about 559 calories per 100 g. In addition, they are packed with fiber, vitamins, minerals, and numerous health promoting antioxidants. Their high calorific value mainly comes from protein and fats. Nonetheless, the kernels are especially rich in mono-unsaturated fatty acids (MUFA) like oleic acid (18:1) that helps lower bad LDL cholesterol and increases good HDL cholesterol in the blood. Research studies suggest that Mediterranean diet which is liberal in monounsaturated fatty acids help to prevent coronary artery disease and stroke risk by favoring healthy blood lipid profile. 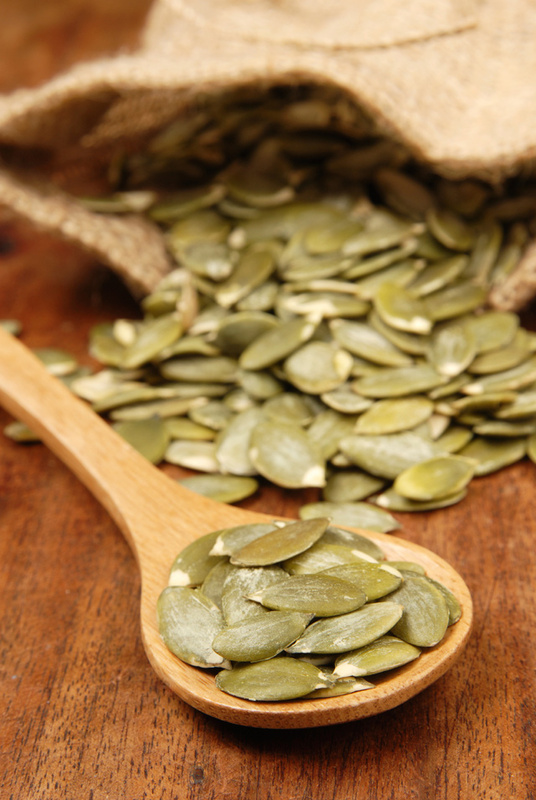 Pumpkin seeds carry good-quality protein. 100 g seeds provide 30 g or 54% of recommended daily allowance of protein. In addition, the seeds are an excellent source of amino acid tryptophan and glutamate. Tryptophan is converted into serotonin and niacin. Serotonin is a beneficial neuro-chemical often labeled as nature's sleeping pill. Further, tryptophan is the precursor of B-complex vitamin, niacin (60 mg of tryptophan = 1 mg niacin). Glutamate is required in the synthesis of gamma-amino butyric acid (GABA). GABA, an anti-stress neurochemical in the brain, helps reducing anxiety, nervous irritability, and other neurotic conditions. Furthermore, its seeds contain good amounts of essential minerals like copper, manganese, potassium, calcium, iron, magnesium, zinc and selenium. Just as in pine nuts, pumpkin seeds too are very rich in manganese (provide 4543 mg per 100 g, about 198% of daily-recommended intake). Manganese is an all-important co-factor for antioxidant enzyme, superoxide dismutase. It is therefore, consumption of pumpkin kernels help develop resistance against infectious agents and scavenge harmful oxygen-free radicals. Raw kernels can be enjoyed as healthy snacks. Whole seeds can equally be enjoyable when roasted. In addition, the kernels can be salted or sweetened. In Mexico, the seeds are usually toasted and flavored with salt, lime, or chili peppers, and eaten as snacks. Pumpkin seeds are one of the ingredients in the Mexican mole sauce. Just like other nuts and seeds, they can also be used in granolas, biscuits, breads, cookies, casseroles or baked goods. The seeds also used in salads especially sprinkled over fruit/vegetable salads. You may add them to desserts, particularly sundaes and other confectionary. The seeds are frequently added to enrich in meat, poultry, rice, and vegetable dishes. Pumpkin seed oil is used in salad dressing as well as in cooking. In Austrian-Styria, the oil is mostly used to add to soups and salad dressings along with vinegar, salt and minced garlic. Nuts are pricey these days, so you need to make sure you're storing them correctly for lasting freshness. Glass, plastic containers and our heavy, reclosable ziplock bags are good for storage. Metallic containers, light, moisture and heat will all conspire to spoil nuts more quickly. 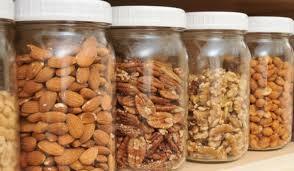 Light can cause the nuts to go rancid at a quicker pace, so you're better off storing them in a cabinet. Nuts also have a tendency to absorb odors from their immediate environment, so keeping them separate from other foods is wise. We have learned not to pack mints in the same gift packs with nuts! Certain nuts will expire more quickly than others. Peanuts, pecans and walnuts are some of the first to go, with almonds and cashews being the most hardy. Nuts become chewy and soggy as they begin to turn and will eventually become rancid. To freshen the nuts you can bake them in the oven on 350 degrees for ten minutes. 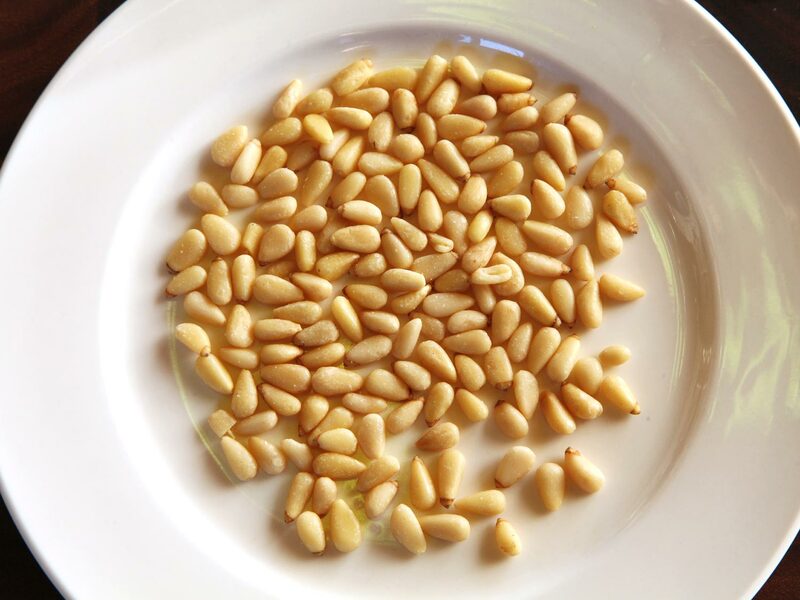 Toasting nuts enhances their flavor. There are three ways to toast nuts: Oven, Stove Top, or Microwave. We don't generally recommend the stove top method, since your chances of burning them are greater. For either the oven or microwave method, we recommend tossing the nuts first with a light layer of oil. This allows for more even toasting and better flavor. 2. Microwave - Add a half teaspoon of vegetable oil to a cup of nuts and spread in a single layer on a microwave-safe plate. Microwave the nuts at one-minute intervals, stirring in between. Depending on the amount and type of nuts, this can take between three and eight minutes. Microwaving the nuts allows for even cooking from all directions, and cooks the inside and outside of the nuts at basically the same rate. Your kitchen should fill with deliciously nutty aroma. Enjoy!